We keep finding ourselves here. 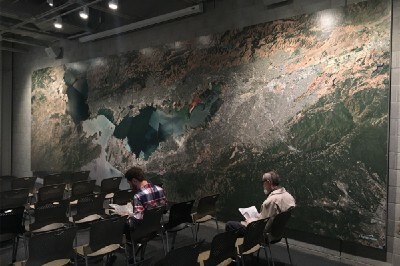 Last time I published an article I spoke about how I went about creating a 3D cut map for Matson’s office in Oakland with Stamen. 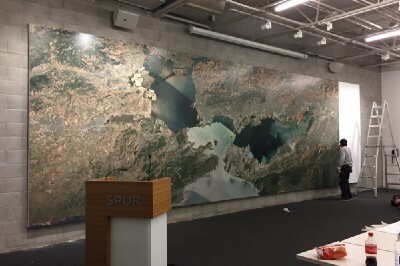 In this post I’ll outline what it took to make a 32′x10′ high res satellite image (that’s 13,824,000 pixels) for SPUR’s office in SOMA. SPUR is a Planning and Urban Research Association based out of San Francisco with offices in Oakland and San Jose. 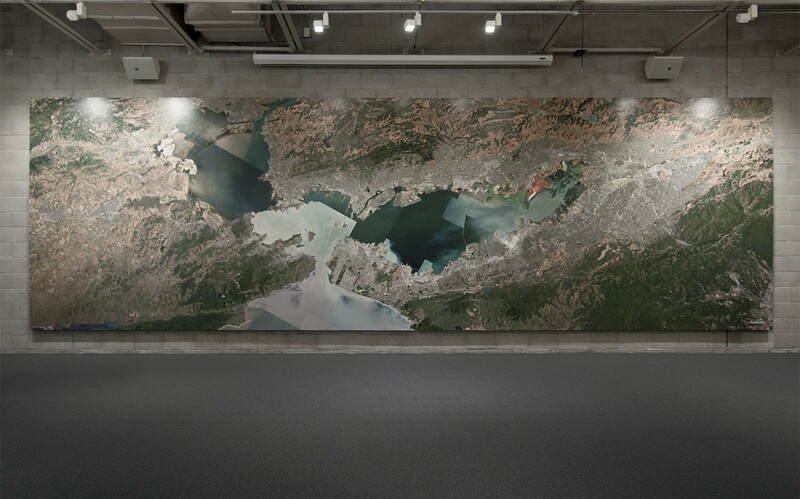 They asked Stamen to create a satellite image of the Bay Area to highlight the breadth of their operation. We knew two things early on. One, we wanted to show the entire Bay Area; from Marin to San Jose and San Francisco to Vallejo. 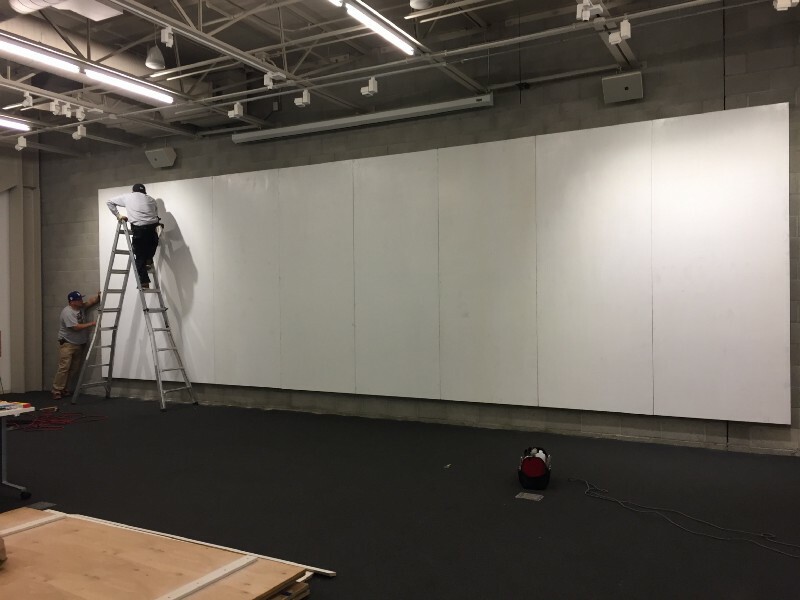 And two, we wanted to fill the space the piece was going, a roughly 14’x40′ wall. 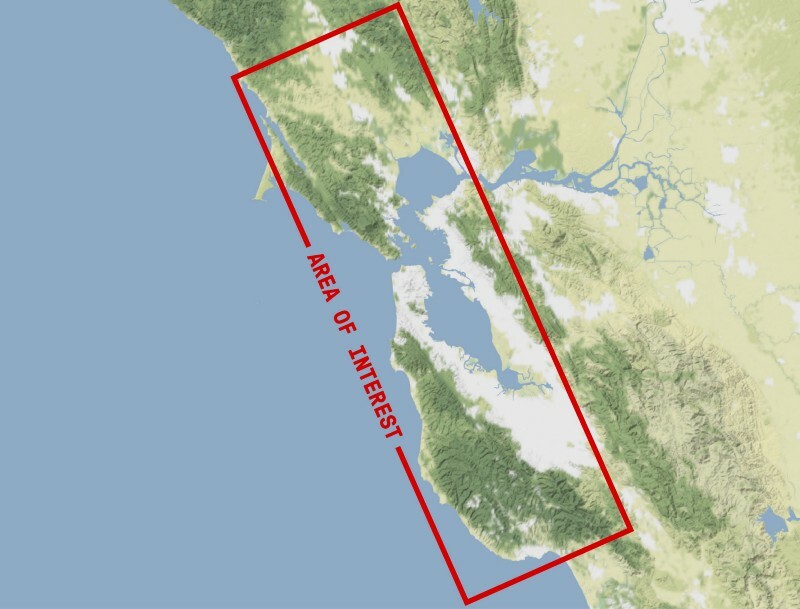 If you’re familiar with the Bay you will know the area of interest runs vertically whereas our wall was a very wide, horizontal area. We decided to rotate the image counterclockwise to compensate for this. Typically images of this size (like billboards) are viewed from a distance so the resolution of the image isn’t a priority. 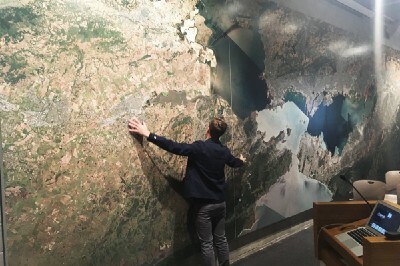 However, since our map was going to be displayed in a room where it could be seen both up close and from a distance we wanted to use the best, highest resolution imagery we could get our hands on. So we reached out to our friends at DigitalGlobe. The area of one tile. We had to stitch over 100 of these together. The resolution was excellent. I actually had to reduce the size of the imagery. 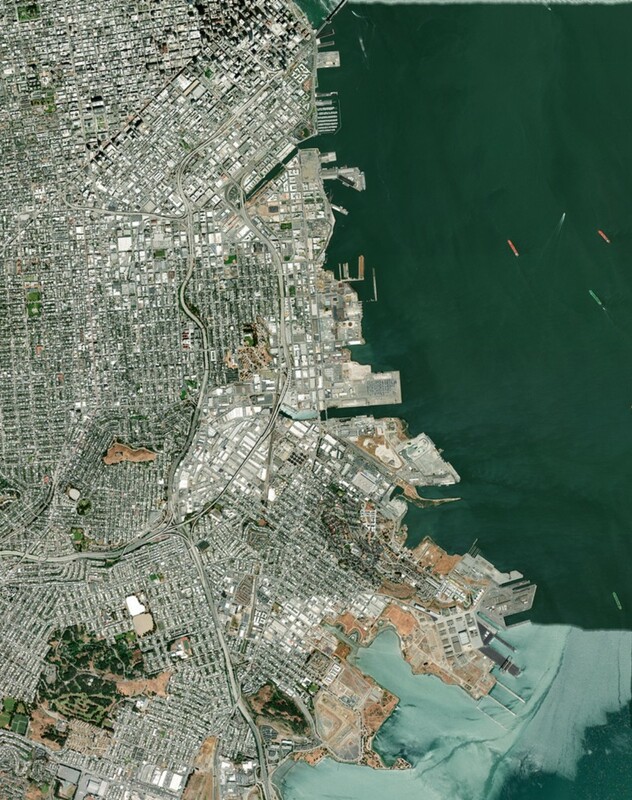 Here is the full-res area over Stamen in the Mission District. That’s Stamen, on the south east corner in the middle. After we received all the tiles from DigitalGlobe it was time to stitch them together. Alan, Stamen’s lead cartographer, created this map for me. It shows the location and number of each tile in relation to the area we wanted to show. I used this as a guide for knowing where each tiles goes as well as what tiles to not use. Finally, I needed to prep the files for the printer, Dynamite Digital. 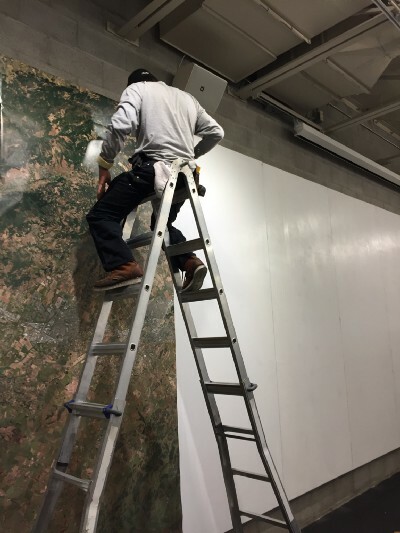 We decided to print the map on a adhesive vinyl that would be applied to a substrate attached to the wall via french cleats. To help make the process easier we divided the image into 8 equally sized images and applied them to 8 identical substrates. David, the installer, applying the first section. We were really thrilled with the piece. It’s hard to capture just how BIG the map is and the amount of endless detail you can find in the images. If you want to see the map in person head over to SPURS website and check out the many events they hold in the space. gives us his perspective on June 15 at the VMA Design Conference as part of San Francisco Design Week. And yes, this article was hijacked from the Stamen website. Check it out!